Race on futuristic terrains, competing in fierce grudge matches againstyour archrival and multiple opponents! It takes a rare combination of racing skill and weapons strategy to achieve ultimate victory in this hyper speed combat racer! 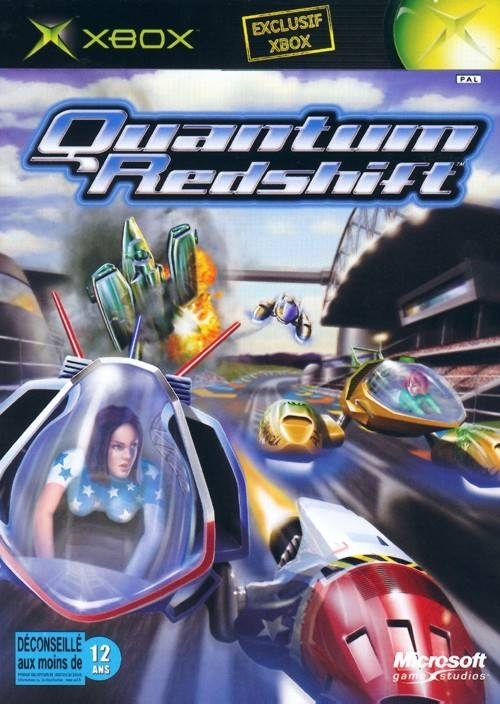 Soundtrack: Quantum Redshiftfeatures a customized soundtrack created by progressive Dutch dance band Junkie XL or JXL for short. Junkie XL scored 16 original compositions for the game; providing a fully interactive music experience designed to give players a musical sense of the action happening in the game. 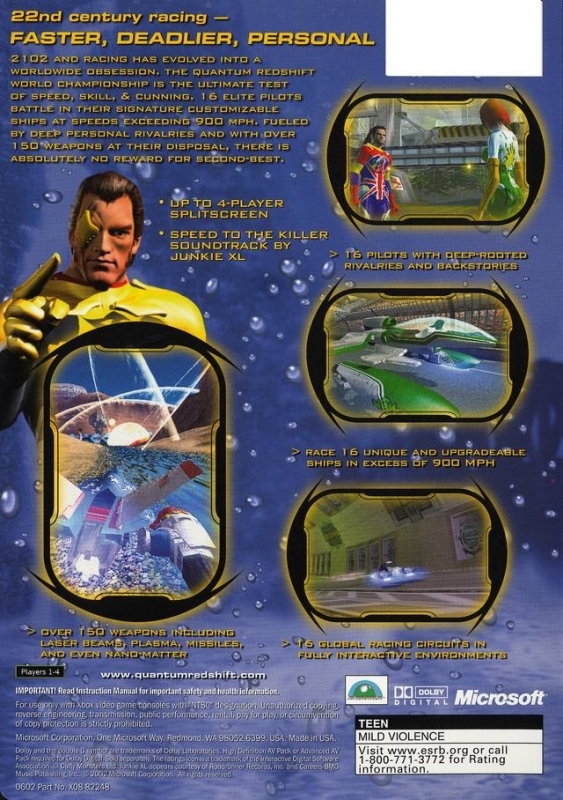 Speed: The game features five levels of hyperspeed with the ultimate level—Quantum Redshift—reaching speeds of more than 900 mph. Gamers earn higher speeds and greater rewards by prevailing in each race and winning trophies. 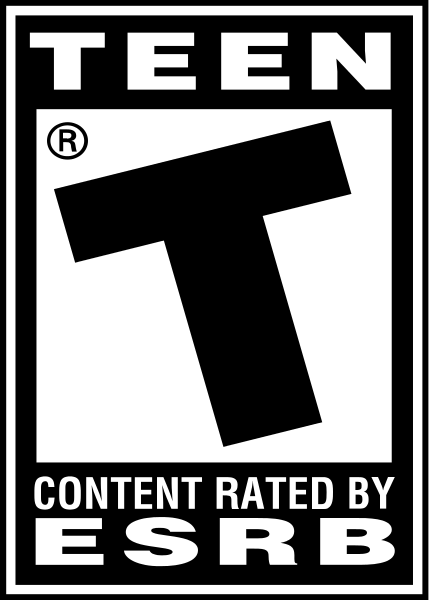 Acquiring trophies at various speed levels unlocks special characters, speeds and tracks, giving Quantum Redshift extended gameplay and depth. Weapons: Each vehicle features unique holographic weapon technology. The game has more than 100 weapons effects, enabling characters to attack with everything from plasma bolts or tidal waves to nuclear weapons. Each vehicle also has unique weapons pickups stationed at various points throughout the game. Characters: Players choose from 16 characters, including Tara Vivas, a former red-hot teen pop sensation; Prince Yuri Galitz, a wealthy Russian who claims to be the last of the Romanov line; and Kumiko Nikaido, the daughter of one of the greatest racers of all time. Each of the 16 drivers has his or her own unique ship, home circuit and weapons. 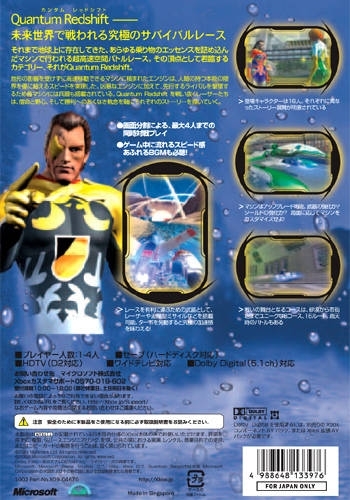 Intense archrival storylines, developed throughout the game via cut scenes and animation, range from "political adversaries" to "estranged lovers." Advanced audio: Quantum Redshifttakes advantage of the audio capabilities of Xbox to support Dolby 5.1, in addition to a fully interactive music soundtrack. 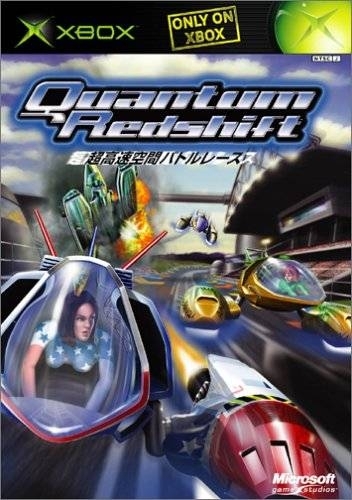 Multiplayer mode: Quantum Redshiftsupports up to four players in split-screen action. Gamers will not only have to beat their friends, they'll have to beat the pilot's archrival. Solar City, a cosmopolitan city sometimes referred to as "Hong Kong Down Under"